On the left a very old suburban train (called lovingly by its users the "little grays") and right next to him the new set that is going to remplace him in the next few years. The difference between those two is allmost shocking, I kind of like the old sets (stain body, door that can be opened during rolling and orange sits from outer-time) but the new one totally rocks. And extre image, the new beouty alone on the tracks of Paris Gare du Nord. Which trains, or maybe we don't speak about the same thing. 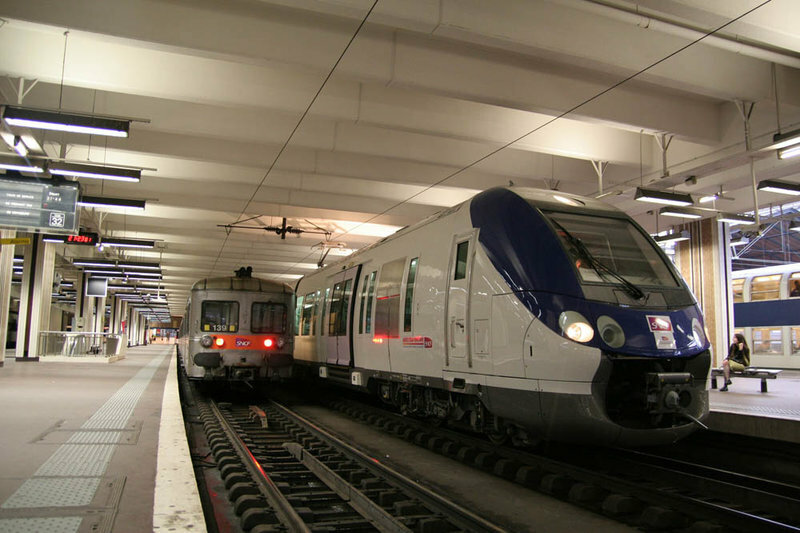 In Paris some Metropolitain drivers decide to give the possibility to the passenger to open the door before the complete stop of the train. In the "ptits gris" (or "little grays" in english) this is possible allmost whenever and is a construction default. - Banlieue Sud-Est : Paris-Gare de Lyon - Montargis/Montereau (via Moret), Juvisy - Melun, Melun - Montereau (via Héricy), Moret-Veneux-les-Sablons - Montargis. - Banlieue : Paris-Gare du Nord, I didn't find the lines but I guess they run allmost everywhere over there. Anyway you will just need to go inside the surface station and will be able to spot them. edit: if you want I can try to spot more website showing photos of these trains. Thanks disturb. I see about the broken doors...Yes, the Metro trains were the ones with the door latch which you opened a few seconds before stopping, I was surprised to see that at first, then did it myself- very convenient for a fast walker like me who doesn't like to get stuck in the crowd! Good information there- don't bother about finding the pics on my account, thanks anyway! They are not really broken either, they were kind of designed like that. ;D I remember taking such a train when I was quite young and seing a guy open the door to be able to smoke is cigarette. All that when the train was at full speed, around 100kph. Yes, the Metro trains were the ones with the door latch which you opened a few seconds before stopping, I was surprised to see that at first, then did it myself- very convenient for a fast walker like me who doesn't like to get stuck in the crowd! I will add one or two things. The new units, are of course very sleek, but they could be a train in any country, while the old ones really say "SNCF suburban". 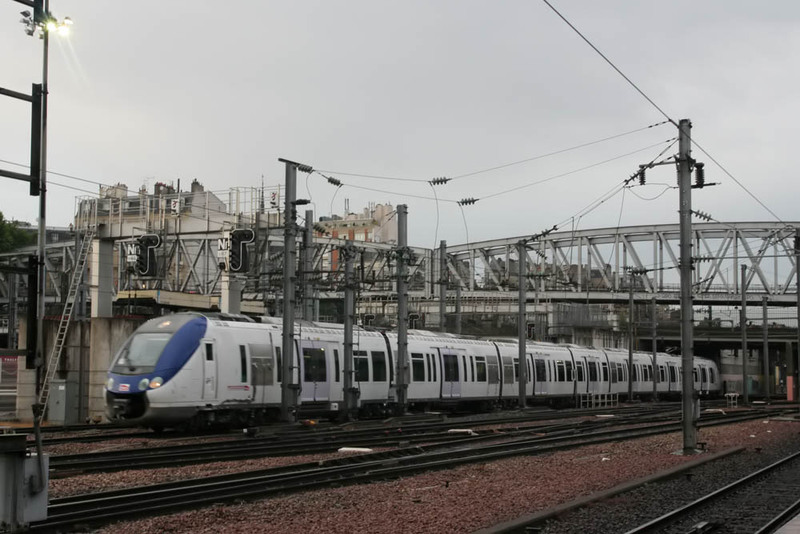 - Like any TGV the elements of the train are supported by only two half bogies. - The train is extra wide, its width is 3m06. As to speak about really french train design, I'm myslef totally in love with this beautie. But that's for another topic. They still are, they still are. In fact the CC 72000 are still rolling as we speak. They are having some hard time right know (some have burned I think and they encounter a lot of technical problems) but they roll even if everybody wishes to see them go away and replaced by some DMU or Bi-modal EMU/DMU sets.